Excellent We found our room at this hotel to be nothing more than excellent. The overall layout of the room was lovely. The bed was comfortable and the styling of the room was also modern. Recommended. Great Location WE were a family of 4 travelling from NZ. 2 children ages 9 and 12. We were very impressed with the service when we checked in. It was so quick and very professional. All the staff, including the cleaners were so helpful and very friendly. All that is needed Great place for transiting in San Fran. Free airport shuttle was a very nice addition, and staff easily accommodated out request for a change of room type on arrival. Average hotel but close to Union Square I wouldn't stay here again, it was too old and dark. The restaurant breakfast was very average. The upside was if was conveniently close to Union Square where all the main shops are located. Headed to San Francisco and looking for somewhere to crash? Reserve a seriously good-looking hotel rate on lastminute.com.au. If our deals were on a dating app, you'd be swiping right on all of them! Want to base yourself in the thick of the action? No sweat. You can take your pick of a whopping 171 hotels within 2 kilometres of the centre. The St. Regis San Francisco and the Loews Regency San Francisco are a couple of the most central places to crash in San Francisco. 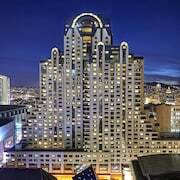 You should also have a look at the Four Seasons Hotel San Francisco and The Ritz-Carlton, San Francisco. 0.9 kilometres outside of the centre of town is Downtown San Francisco, which contains 133 accommodations. Consider booking a room at the Sumner House SF and JW Marriott San Francisco Union Square. Tenderloin, 0.7 kilometres from the centre of town, is one more well-known neighbourhood. 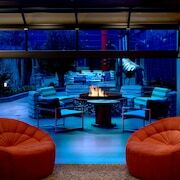 A few of the 38 options available here are the Clift and The Marker San Francisco, a Joie de Vivre Hotel. Full-on sightseer or casual globetrotter, the University of San Francisco has gotta be seen! 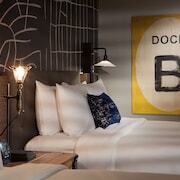 The Hotel Drisco and Laurel Inn, a Joie de Vivre Boutique Hotel are super close. Just drop off your bags and you can be there in a flash. 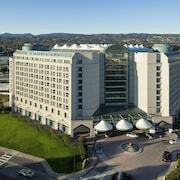 The Fairmont Heritage Place, Ghirardelli Square and the Taj Campton Place are near the Exploratorium. Handy, right? The San Francisco Museum of Modern Art, another epic attraction, is just a breezy stroll from the W San Francisco and the Argonaut Hotel - a Noble House Hotel. 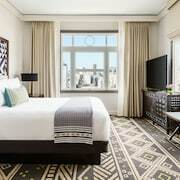 If TransAmerica Pyramid is right up there on your must-see list, you may want to book a few nights at the Hotel Zetta San Francisco or the Fairmont San Francisco. The Scarlet Huntington Hotel and the San Francisco Marriott Union Square also have rooms ready for those looking to chill out closer to Coit Tower. Those with an interest in impressive engineering and historic structures should visit Lefty O'Doul Bridge. Wyndham Canterbury at San Francisco and Inn At Union Square - A Greystone Hotel are two legit options if you and the squad are eager to stay in the vicinity. Contemporary Jewish Museum is a worthwhile place to keep yourself busy. You can spend time at it whenever, especially if you're crashing at the Omni San Francisco Hotel and InterContinental Mark Hopkins. Ever had to spend a long night on the hard airport floor cos you got too excited and forgot to make a hotel booking? Save yourself the backache and snap up a room at the Holiday Inn Oakland Airport or the Holiday Inn Express Hotel & Suites Oakland-Airport. 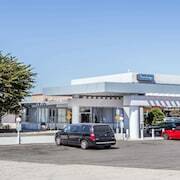 They're not far from Oakland International Airport, which is just 19 kilometres from San Francisco's centre.